Roper Whitney announced a new partnership with Swiss-based manufacturer Eckold. Since 1957, Eckold has specialized in providing sheet metal forming equipment and CNC services. Eckold currently services industry sectors including: metal cladding and construction; aircraft production and maintenance; train, railway and carriages; ship, boat and yacht building; vessel and tank construction; and car and bike industries. Wheeling: Tools for hand-forming sheet metal; frequently used to create custom pieces for bikes, race cars and car restoration. For more information, visit www.roperwhitney.com. Columbia Roofing & Sheet Metal has hired Vijay Shankar as Vice President and General Manager. In this role at the Tualatin-based company since the fall of 2017, Shankar brings extensive systems administration and business re-engineering expertise. Shankar has worked in a variety of industries, including government, manufacturing, wholesale distribution, healthcare and construction. His expertise is in business and financial leadership, financial systems implementation and integration, process development, business re-engineering such as successful turnarounds. Most recently, Shankar served as a business and financial executive at West Side Electric Co. in Portland. He holds a Master of Business Administration from the University of South Pacific in Fiji. “I was attracted to Columbia Roofing & Sheet Metal because of its focus on cultivating and maintaining a healthy business culture,” Shankar said. Columbia Roofing & Sheet Metal’s CEO Mark Carpenter, said he is thrilled to have someone of Shankar’s level of professionalism in such a key role inside his company. For more information, visit www.reroofnow.com. Diversification has always been a key component of Paul Graham’s business philosophy. Graham is the president of StazOn Roofing Inc., headquartered in Dallas, Texas. The company has been in business 38 years, handling all types of roofing, custom sheet metal fabrication and specialty wall panel systems. Graham designed his company to be able to tackle multiple scopes of work on complicated projects. “Through time and through practice on all of these jobs, we’ve just been able to step up to the plate and maintain a multi-level task force to handle different types of work on the job,” he says. The buildings featured a blend of different roof systems. 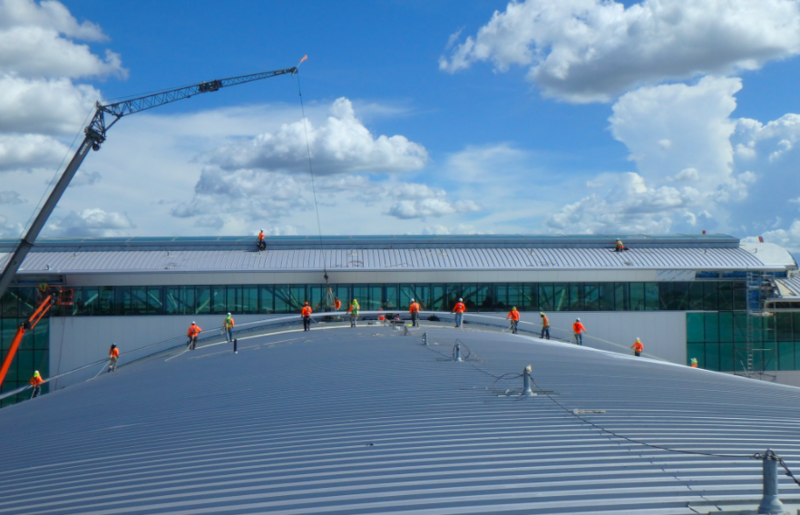 Crews from StazOn installed 60,000 square feet of shingles on roofs with a 4:12 pitch, 52,000 square feet of TPO on low-slope areas, and 8,500 square feet of standing seam metal roofing on roofs with an 8:12 pitch. They installed 22,000 square feet of standing seam wall panel cladding. The metal roof and wall panels were custom fabricated by StazOn with PAC-CLAD metal from Petersen in two colors, Zinc and Weathered Steel. Graham credits the Dallas-based builder and the Dallas-based architecture firm, JHP, for spearheading the successful project. “It’s nice when you have a team you’ve worked with and everyone understands what needs to be done to satisfy the client’s desires,” he says. 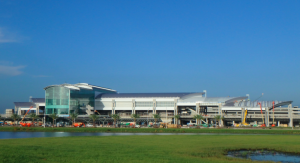 Architectural Sheet Metal Inc. has been in servicing the Orlando area for more than 23 years, specializing in commercial metal roofs and wall systems, primarily new construction. 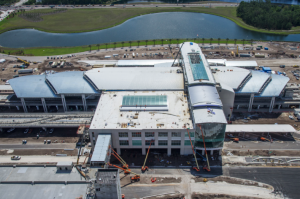 When Matthew Leonard, the company’s vice president, found out that the Orlando International Airport was proposing a new terminal project with a metal roof, he jumped at the chance to submit a bid. The South Airport Intermodal Terminal Facility and APM Complex is a new construction project that coordinates mass transit for the airport, including regional rail systems and the Automated People Mover (APM). 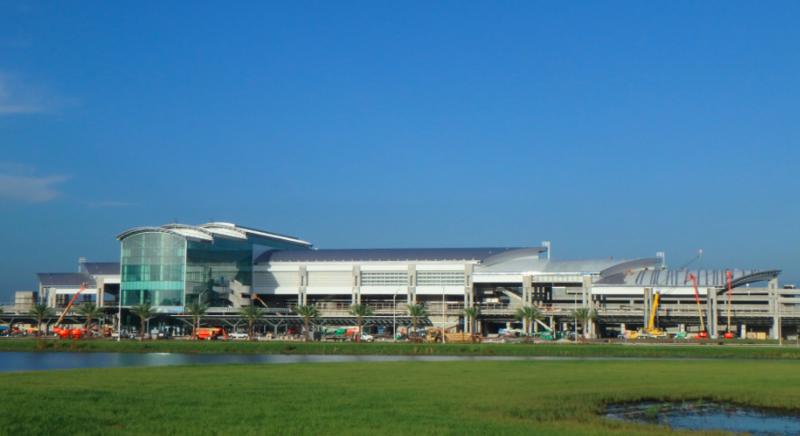 It’s part of the first phase of an ambitious $2 billion plan to almost double the size of the airport. 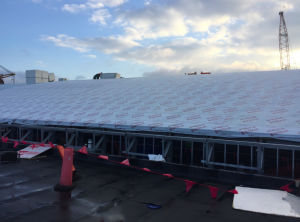 Crews dried in the entire roof with a waterproofing underlayment from MFM Building Products specifically designed for high-temperature applications. The other sections were comprised of standard type B metal deck. Sections covering the interior were insulated, while canopy sections were covered with 5/8-inch DensDeck from Georgia-Pacific. Metal roof panels were roll formed at the site. 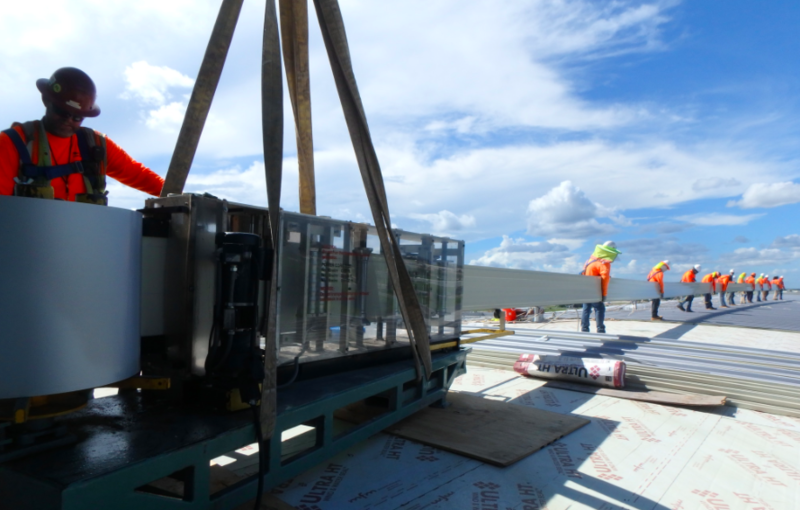 For most roof sections, the roll former was hoisted by a crane, to the edge of the roof, and crew members stacked the panels as they come out of the roll former. 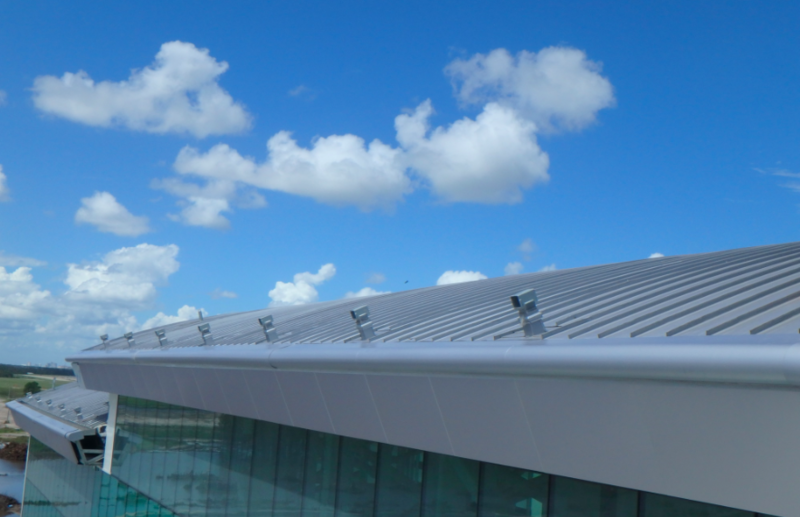 The aluminum bullnose was constructed after precise measurements were taken at the site. 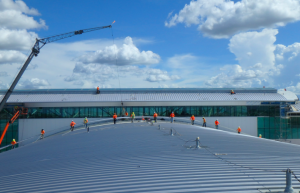 After they were custom painted to match the roof, the 30-foot sections were lifted into place and installed. The bullnose was designed to hook into the gutter strap and wrap around onto the fascia, where it is screwed into the framing. 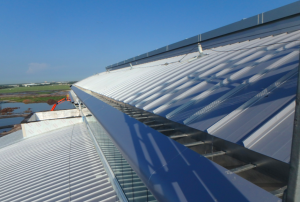 In areas where there is no gutter, sections of the bullnose are equipped with a larger flange with an S-hook built into it to attach it to the roof. Corner pieces tie it all together. As the storm progressed, it deviated from the projected path, and no one could be certain which direction the winds might be coming from. “We just had to start battening everything down,” Leonard recalls. Photos: Architectural Sheet Metal Inc.
After the storm passed, Leonard breathed a sigh of relief. The roof wasn’t damaged. The panels that had already been installed were in great shape, and the uninstalled panels weren’t harmed. The 100 percent Silicone Sealant seals and repairs roofs, masonry, architectural sheet metal, and metal roof seams and fasteners. Mule-Hide Products Co. has added 100 percent Silicone Sealant choices to its Silicone Roof Coating System, expanding the color offering to include clear and the packaging options to include 10-ounce tubes. 100 percent Silicone Sealant is a mastic version of the Mule-Hide 100 percent Silicone Roof Coating. It is a moisture-cure silicone sealant designed for use in sealing and repairing roofs, masonry, architectural sheet metal, and metal roof seams and fasteners. 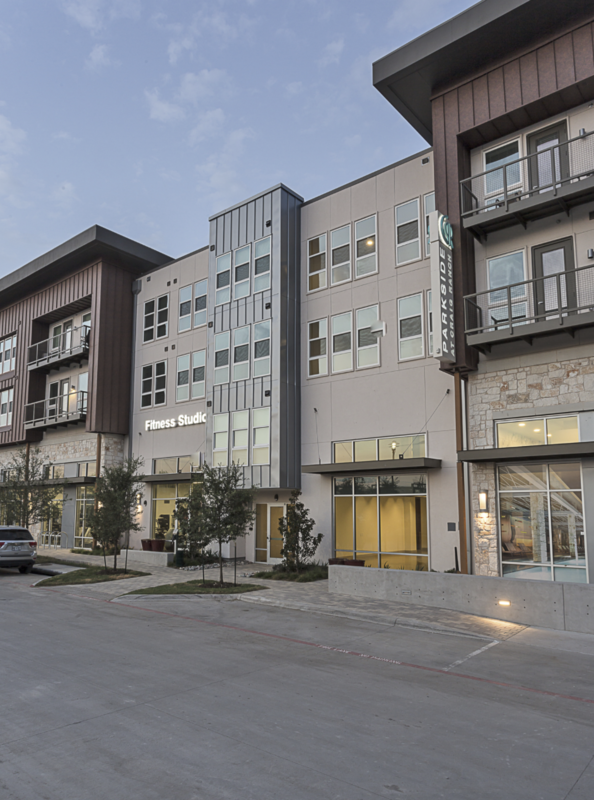 The addition of clear sealant allows contractors to complete projects that would otherwise require color-matching. It is available packaged in tubes only. In addition to clear, the tubes are available filled with white sealant. The plastic cartridges are an option for use in smaller applications or when precision is required. They also can be submerged under water to repair roof leaks, gutters and downspouts. 100 percent Silicone Sealant provides adhesion to concrete, masonry, polyurethane foam, EPDM membranes, TPO membranes, aged PVC membranes, aged acrylic coatings, granular cap sheets, wood, metals, Kynar finishes and most other building materials. When using 100 percent Silicone Sealant with a TPO roof membrane, Mule-Hide Si TPO Primer must be applied first. The sealant has minimal odor, making it contractor- and building-occupant-friendly. Its volatile organic compound (VOC) content of less than 10 grams per liter makes it acceptable for use in areas with VOC restrictions. It does not corrode metals. CATHEDRAL OF ST. PAUL, BIRMINGHAM, ALA. The cathedral’s intricate slate tile patterns incorporated three slate colors and square and deep bevel cut tiles. 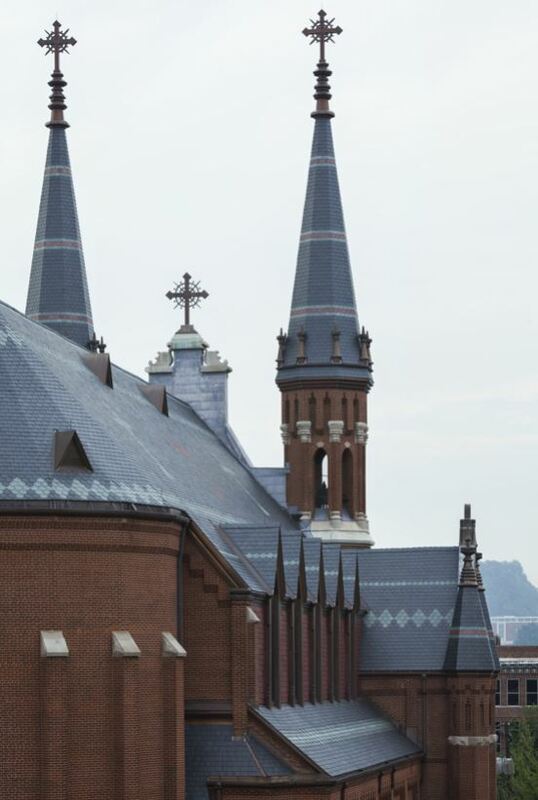 The Catholic Archdiocese of Birmingham required the cathedral’s new roof system be a historically accurate reproduction of the original in materials, design and craftsmanship. The cathedral’s intricate slate tile patterns incorporated three slate colors and square and deep bevel cut tiles. Six large slate crosses and multiple accent patterns, barely visible on the faded original roof, required exacting measurements prior to tear-off and a high level of precision to recreate and maintain over such a large field and on octagonal steeples. Because of metal thinning brought on by their advanced age, every copper architectural and functional feature in the existing roof system had to be carefully removed and shipped to Midland Engineering’s South Bend facility to be historically replicated in its metal shop. This included seven ornate crosses (up to 17-feet tall), finials, turret caps and more. There were more than four dozen components, for which no original prints existed, as well as over 500 feet each of custom copper cornices and radius gutters with matching straps. More than 20,000 square feet of 16- and 20-ounce copper was utilized for fabrication of architectural elements and flashing. Midland Engineering was asked to make improvements to the original roof system to improve attic ventilation while maintaining the Gothic Revival period look. 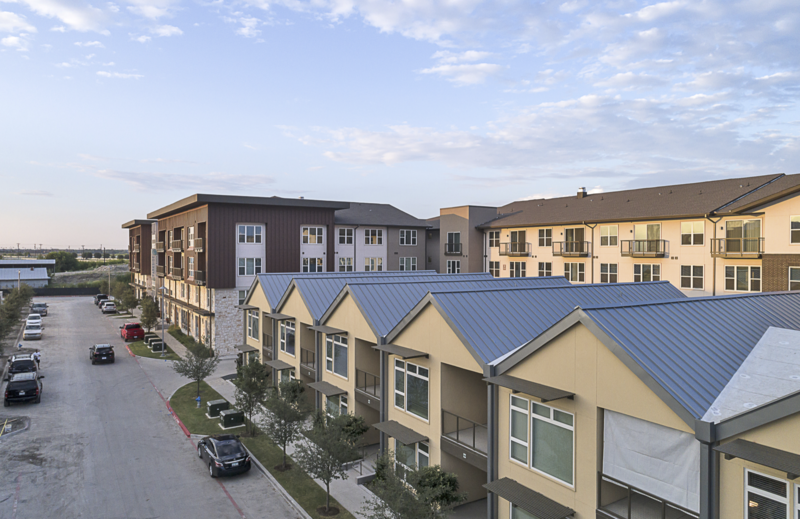 To accomplish this, the crew integrated bronze screen (invisible from the ground) into the original copper cornice and eave design to provide improved cold air intake while new louvered copper dormers replaced the original painted roof ventilator. An updated lightning protection system was incorporated into the new roof design, hidden within many of the new copper crosses and other architectural elements. The system was fabricated in Midland Engineering’s shop to maintain the Gothic Revival look. The metal shop also clad 10 previously painted windows and mullions in copper, effectively eliminating frequent and costly maintenance. These windows, reachable only by crane at considerable expense, formerly required painting and other maintenance every five to seven years. About 6,500 square feet of lead-coated copper, which patinas to a limestone color, was utilized to cap all limestone exposed to weather, reducing ongoing maintenance of limestone joints. Extensive termite damage to structural framing required repair prior to installation of the new roofing system. Upon removal of the original slate roof and completion of the structural repairs, the new roof was dried-in and installation of the new slate roof began. The historically accurate replacements of the original copper architectural features were installed according to schedule. The Cathedral of St. Paul is the centerpiece of the Roman Catholic Diocese of Birmingham. Completed in 1893 at a cost of $90,000, the cathedral is widely considered to be a handsome example of the American Neo-Gothic variant of the Gothic Revival style. The cathedral measures 96-feet wide by 140-feet long and encompasses more than 60,000 square feet. It features twin octagonal steeples, rising 183-feet high. Work schedules on this project were a challenge. The contract required parishioner and clergy access to the church must be maintained 24 hours a day, seven days a week, throughout the eight-month duration of the project. Further, because of the noise inherent in roof construction, work schedules had to be planned around regular church services and events and rescheduled several times a month for funerals and other unscheduled events. The National Roofing Contractors Association, Rosemont, Ill., awarded Midland Engineering the prestigious Gold Circle Award in 2016. 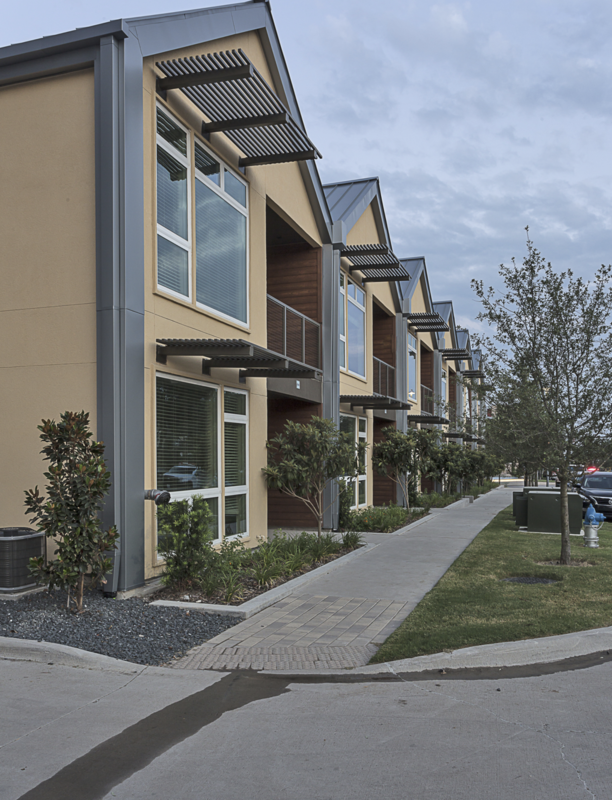 Midland was recognized in the Outstanding Workmanship—Steep-slope Category. Filed Under: Historic, Projects Tagged With: Alpine SnowGuards, architectural, ArchitectureWorks LLP, baker roofing co., CATHEDRAL OF ST. PAUL, cladding, copper, DAUGHTERS OF THE AMERICAN REVOLUTION, dormers, Duke University Chapel, flashing, framing, Greenstone Slate Co., gutters, Hayden Building Maintenance Corp., historic preservation, Hoar Construction LLC, James R. Walls Contracting Co. Inc., JRWCo, limestone, Midland Engineering Co., National Roofing Contractors Association, renovation, restoration, Roman Catholic Diocese of Birmingham, Romeo Guest Construction, Roof Consulting Services Inc., roof system, roofing, sheet metal, slate roof, steep slope, TJS Custom Construction Inc., TUXEDO TRAIN STATION, Unimet Metal Supply, windows, Ziolkowski Construction Inc. The wrench-free nibbler features a rotating head for operation. Kett Tool Company has introduced the KL-2020 14-Gauge Nibbler, wrench-free nibbler featuring a rotating head for operation. The KL-2020 boasts a die design that allows for maneuverability in cutting sheet metal. Metal fabricators, auto manufacturers and construction crews will appreciate the KL-2020 nibbler that can be locked into four different positions (in 90-degree increments). A rotation of the hand changes the angle of the die while the free-floating punch design extends time between replacements. The KL-2020 cuts 14-gauge cold rolled (C.R.) mild steel and most grades of stainless to 16-gauge. At just 10.5 inches and four pounds, this four-amp, 2500 RPM straight handle electric nibbler is easy to handle and store at any job site. It delivers a clean burr-free cut of flat and corrugated sheet metal up to 65 inches per minute. The KL-2020 Nibbler is available through authorized dealers. 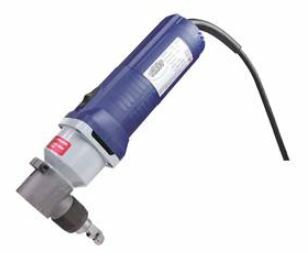 For more information or to locate a dealer, users can visit Kett Tool or call (513)271-0333. The Metal Construction Association (MCA) welcomes CIDAN Machinery to its membership roster. The company has joined the association’s ranks of about 75 member companies with specialties in the metal construction industry. CIDAN Machinery has manufactured machines since 1907 and is a well-established company within the sheet metal industry. The company manufactures and markets the brands CIDAN and Göteneds at its factory in Götene, Sweden. “CIDAN Machinery is excited to participate in networking and stay current with the metal construction industry,” says Larry Chandonnet, CIDAN’s president. MCA member companies benefit from participation in association activities that focus on research, codes and standards, market development, and technical programs. 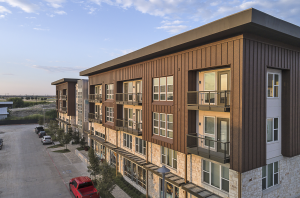 The association works to increase the use of metal materials in construction by educating the building and design communities about the benefits of metal. MCA members represent a broad scope of companies including metal roof, wall panel, shingles and coatings manufacturers, coil coaters and metal producers, distributors, equipment and accessories manufacturers, energy insulation system manufacturers, and MCM fabricators. Membership information kits for each industry segment are available on MCA’s website. The Roof Coatings Manufacturers Association (RCMA) kicked off its Speakers Bureau program with a presentation by Joseph Sorrentino, Uniflex/Sherwin Williams, for the Carolinas Roofing and Sheet Metal Contractors Association’s (CRSMCA) district meeting. The CRSMCA district meeting took place in Concord, N.C., at the Embassy Suites Charlotte-Concord. 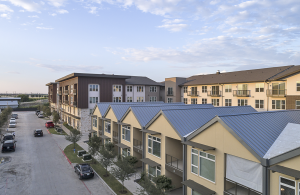 RCMA’s Reflective Roof Coatings: Cool Stories presentation helped CRSMCA to hone its meeting focus on the key benefits and environmental importance of reflective roof coatings used on low-slope roof systems. RCMA is an approved continuing education provider with the American Institute of Architects (AIA), RCI Inc. and the U.S. Green Building Council (GBCI). By attending RCMA’s Reflective Roof Coatings: Cool Stories course, attendees qualify to earn 1 AIA General Learning Unit hour (1 LU hour) as part of AIA’s continuing education system, 1 RCI continuing education hour (CEH), or 1 GBCI continuing education hour (1 GBCI CE hour).